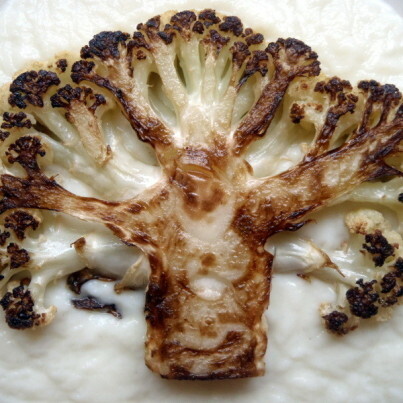 Cauliflower 'Steaks' Are Everywhere. But Why Are We Calling Them That? 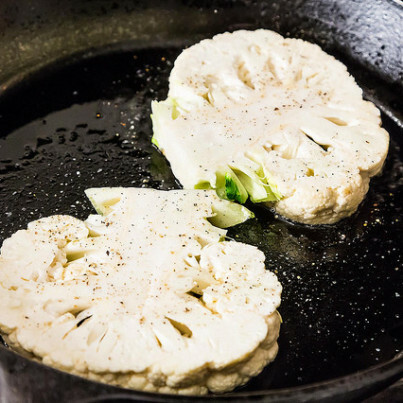 What's the deal with cauliflower steaks? We at HuffPost Taste are big fans of cauliflower -- that noble crucifer that's been getting so much attention lately. And we love a split, roasted cauliflower -- a preparation that has been hugely popular over the past few years. Why, however, is everyone calling it a steak? The so-called cauliflower "steak" is now a regular on menus, food magazines and food blogs all over the place. We've seen it roasted with ginger and cumin, served on top of cauliflower puree and made with lemon and parsley. We understand why the dish is so popular. We love the fact that you don't have to cut individual florets, and we love the way the entire side soaks up flavor from a pan. 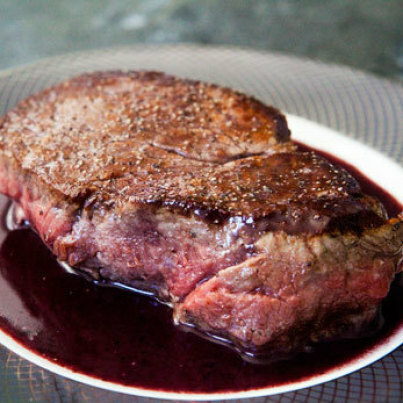 What we don't quite understand, however, is why everyone is calling it a "steak." LA-based restaurant Superba Snackbar even calls its cauliflower steak a "T-bone." We love vegetarian food (and some of us are, or have been, vegetarians), but we love it for what it is -- not for what it isn't. We don't compare the vegetarian food we eat to meat because we love it in its own right. We don't look at vegetarian food as a replacement, in other words. When we eat a veggie burger, we don't compare it to a beef burger, for example. When we're enjoying a delicious slab of roasted cauliflower, we don't compare it to a meaty steak. Why call one of them a steak, and necessarily compare it to meat, when the cauliflower is its own, wonderful, independent dish? One does not have to be a replacement for the other. The cauliflower isn't the only vegetable that has been called a steak, either. Chef Dan Barber of Blue Hill has served a highly praised cauliflower steak at his restaurant, and is also now serving a parsnip steak. He told Esquire that after cooking the parsnip under a brick, "it essentially starts to look like a well-marbled steak." He serves it with pork-belly sauce. To all the vegetarians out there, do you like the idea of likening your vegetable to meat? Or would you prefer that we not call it a "steak?" Want to read more from HuffPost Taste? Follow us on Twitter, Facebook, Pinterest and Tumblr.